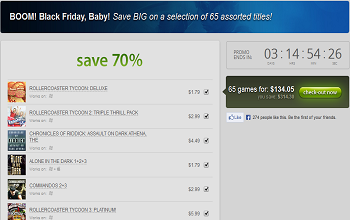 More than 60 games will receive a 70 percent discount during GOG's Black Friday weekend sale. Black Friday has arrived bringing with the usual yearly plethora of good deals and horrible human beings willing to do anything to take advantage of them. Likely hoping gamers might turn some of their berserker shopping rage its way, GOG has, in turn, launched its own Black Friday sale. The GOG Black Friday Weekend Promo will offer a 70 percent discount on 65 games from the site's library and will run from Friday the 29th until Tuesday, December 3rd. The sale will include a selection of games stemming from almost every genre to ensure that there's something for everyone. For instance, point-and-click adventure fans will be able to pick up titles like Simon the Sorcerer on the cheap, while shooters like Chronicles of Riddick: The Assault on Black Athena also riding the discount train. Sim aficionados likewise will find Rollecoaster Tycoon Deluxe, among others, with its price slashed. All in all, the full list is an impressive array of games and franchises that are sure to keep you entertained and your bank account happy. Perhaps the best part, of course, is that you can take advantage of GOG's Black Friday sale from the comfort of your own home. There are no crowds to fight or shoppers being trampled. You don't even have to feel guilty about the retail workers being put through hell. All there is are sweet, delicious deals. So if you feel a hankering to pick up some new (or old) games this Black Friday, you may want to swing by GOG and give its offerings a look-see.